Working with Good, Form & Spectacle, a site that explores 60 years of data for New York’s Museum of Modern Art. 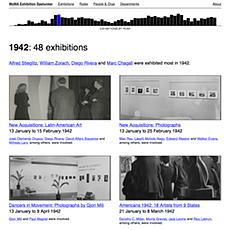 It combines MoMA’s data with more from Wikidata and the New York Times , and has several visualisations (using D3.js) providing overviews of the organisation and its work over the decades. Also with Good, Form & Spectacle, the Waddesdon Bequest site for the British Museum displays all the exhibits from one collection. Users can compare the objects by size, weight, origin, year of acquisition, and more. 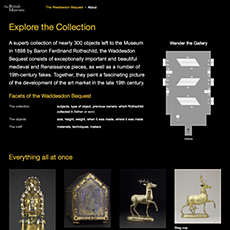 Every object features information from the British Museum’s archive and detailed zoomable photos. 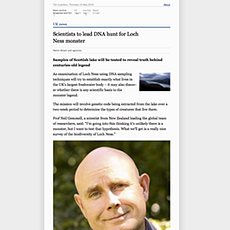 A self-directed project from 2010, building a browsable online version of a newspaper, using the Guardian ’s API. Read more about the design thinking. This was later taken further in collaboration with BERG, funded by the Guardian , to create “a newspaper that looks back at you”. Read more about it. A thoughtful narrative experience promoting a film, Dreams of a Life , built with Hide&Seek for Film 4, written by A.L. Kennedy, with photography by Lottie Davies. 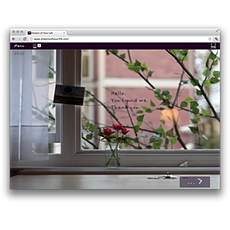 The branching conversational story was built using a custom admin system that allowed for adjustments as the project was developed.